Finding a good beard trimmer is not as easy as you’d think. I’ve been through many looking for the best one, as there’s a lot of different options on the market. The PG6171 is one of the more popular options availabe right now, especially because it’s super budget friendly. But is it worth the purchase, or are there other better beard trimmers available? Remington has developed an excellent line of trimmers that help you to get wonderful look you desire. They’re one of the most popular brands around and have been for a long while now. Their PG6171 model is one of the better budget options to choose if you’re looking to save cash. This Remington PG6171 ‘Beard Boss’ Kit will undoubtedly help you to get your desired look, especially if you really like to take care of your beard and try new styles. Even the thickest hair won’t be a problem anymore as this product has a turbo mode, which lets you power through all kinds of long and thick hair. You will be able to design your own beard styles, and the control will be only yours. The Remington PG6171 has 11 pieces with combs and 15 different length settings. It has a solid battery which provides 3 hours of cordless use. It’s also pretty damn cheap. But what we want to know is; can it trim your beard as well as some of the competitors? Well, apparently so. For a cheap price, you can easily get everything you need to look perfect in just one trimmer. But is it too good to be true? Let’s take a look! The blades stay sharp for a long time, so users won’t have a problem after continuous use. As the blades are made of stainless steel, they can last for a much longer time than if they were made with other materials. Remington PG6171 uses lithium battery which is particularly strong. You can expect about 3 hours of battery life with the PG6171, which is far greater than some competitors. On top of the powerful battery, you have a ‘quick charge’ setting. This means that with only 5-minute charging, the trimmer will be full for one full trim. If you are in a hurry and your trimmer stops working, this wonderful feature will be a lifesaver if you need to charge it up quickly before you leave the house. The clip-on adjustable comb provides you quick changing and choosing one of ten available lengths. You can easily lock-in one of desired lengths, which goes from 2 millimeters to 20 millimeters. With the abundance of different comb lengths, this is a great choice if you want to trim your beard to different grades. 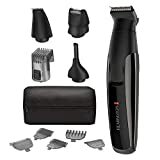 Remington PG6171, 11-piece kit, includes: full size trimmer, nose and ear hair trimmer, detail trimmer, mini foil shaver, six guide combs. It all comes with a zip-storage bag. This trimmer is 100% washable and cleaning it is more than easy. You can clean in everywhere, just with using water. The price for this 11-piece kit is very affordable. For not a big amount of money, you can get everything you need for a perfect facial hairs looks. This product can be used anywhere in the world, as it has universal 100-240V 50/60Hz power supply for charging. All you will need is a plug adapter. You won’t need to worry about water with the PG6171 as it isn’t the type of trimmer to break easily after getting a little water on it. Some reviews that I’ve seen say that you cannot style your beard or moustaches with this trimmer. The T blade is too big and it doesn’t let you make your desired style with beard or your moustaches. This is something worth considering if you need a highly accurate beard trimmer. Compared to some more expensive beard trimmers, this one does feel pretty cheaply made in comparison (probably because it’s cheap!). Remington PG6171 is an ideal product for someone looking for a cheap option beard trimmer. Trimming and grooming your beard and moustache won’t be a problem anymore, as in this package you get all you need. Users can choose between various lengths in order to get desired look. Strong, lithium battery, provides excellent power and it can be used even up to 3 hours, without charging. It is 100% washable and the cleaning is super easy. Under your faucet you can clean everything you need from the trimmer. If it happens to you that the trimmer runs out of battery, with a quick 5-minutes charge, you can get a chance to finish what you have started. Excellent, right? The price of the product is not very high and best of all, you will be satisfied with it.